Don't need color on the inside pages? Discounted B&W pricing is available. 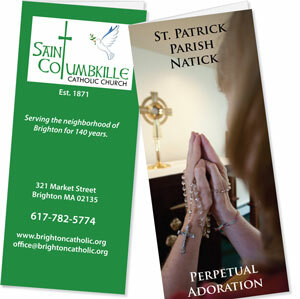 For any of your special events, parish announcements, or banners alerting the public to your holiday Mass schedule, let PilotPrinting serve you for a fraction of the cost you would pay with any other vendor. Find out more about our printing services for churches. We got the posters as promised, and we were blown away by the quality, price, and turnaround time. Thank you so much! Heidrun Ryan, St. Anne Parish, Littleton, Mass. PilotPrinting’s success is they have made His business their business and His mission their mission. 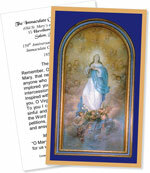 I’ve experienced their quality digital printing and service—at prices substantially below the competition—and I assure that subscribing parishes will not be disappointed. Richard MacKinnon, Pastoral Administrator, Immaculate Conception Parish, Salem, Mass. I just received the Thank You cards. They are absolutely beautiful! I really appreciate all your assistance. Thank you again. Elaine LaMachia, Secretary, Our Lady of Grace Parish, Groton, Mass.